From the moment I heard about J.K. Rowling writing a screenplay inspired by her anthology Fantastic Beasts and Where to Find Them, I was both excited and nervous. Like many others, my childhood and love of reading were fostered by Rowling's incredible Harry Potter series. After the huge commercial and critical success of the 8 Harry Potter films, a spin off of some kind seemed inevitable. Thankfully, Warner Bros. brought most of the filmmakers responsible for those films back to bring Rowling's new story to life. Still, without the success of preexisting source material, Fantastic Beasts was anything but a safe bet. The film opens with British wizard Newt Scamander (Eddie Redmayne) arriving into 1920's New York City. Armed with a suitcase full of illicit magical creatures, all cleverly hidden from the eyes of Muggles (No-Maj's non magical people are called in America), Newt plans to make his way to Arizona to release one of his beasts. As he walks the streets of New York, he is drawn to a large gathering in front of a bank where a woman from the New Salem Philanthropic Society speaks of the evils of wizards and the need for a re institution of witch hunts. A bump in with No-Maj man leads to an unintentional switch in suitcases and the eventual escape of many of Newt's animals. 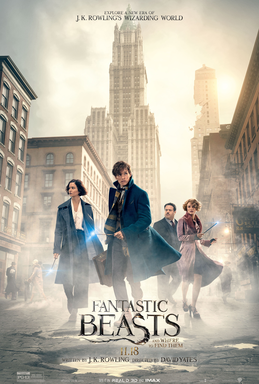 With magical creatures running freely through the heavily populated New York, Newt must turn to the assistance of a group of American Wizards and a No-Maj to capture the beasts. Failure to return the creatures to the safety of his suitcase would place Scamander in serious trouble and threaten to expose the entire magical community to a world that is growing less and less tolerant of their existence. I'll admit to having mixed emotions going into this film. On the one hand, I had faith that Rowling would provide a story that would be a worthy successor to her acclaimed Potter series. At the same time, the announcement of Fantastic Beasts being the start of a five film series had me worried that this franchise would be nothing more than a cash grab. As the movie opened, I feared that my predictions would come true. The mistaken suitcase switch seemed like a rather cliche device that was not worthy of the Potter universe. Those fears were quickly assuaged as Scamander stepped into the vast expanses of his creature carrying case. The film ends up feeling very different from the Potter story, but equally as magical and engaging. Newt Scamander is a misunderstood outcast who sees good in creatures that most would ignore or run from. Each cast member brilliantly brings their characters to life with skill and great care. For her part, Rowling presents a story that is much more complex and layered than I initially perceived. Fantastic Beasts spins an extraordinary fable of acceptance of differences and the role of politics in the fight for those who may be seen as "other". The end of the film provides a satisfying closure to Scamander's story while opening the possibilities to expand the story into what is sure to be a unique franchise. Fantastic Beasts and Where to Find Them is easily the most original and exciting blockbuster of the year, and I can't wait to see where Rowling and company will take this story next! This entry was posted on Friday, December 2, 2016 and is filed under Fantastic Beasts and Where to Find Them,Film Review,Friday Flicks,Harry Potter,J.K. Rowling. You can follow any responses to this entry through the RSS 2.0. You can leave a response. I absolutely loved it. More so than reading the play..which yes I bought and read first. I thought the actor was brilliant and cannot wait to devour the next 4 films. My husband laughs at me because I awaken my inner 9 year old when it comes to Harry Potter anything. I actually decided not to read the play because I figured it was meant to be watched. I think that's the power of Rowling's works, they awaken our inner child!